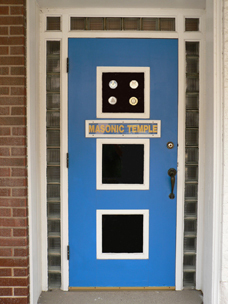 Tuscola Masonic Lodge No. 332, A.F. and A.M. Stated Meetings are held on the second Thursday of the month at 7:00 pm. 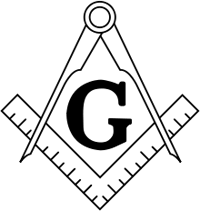 "Freemasonry is kindness in the home; honesty in business; courtesy toward others; dependability in one's work; compassion for the unfortunate; resistance to evil; help for the weak; concern for good government; support for public education; and above all, a life-practicing reverence for God and love of fellow man." The 11th Eastern District Workers Club will meet on Monday, August 25, at 7 pm at Sullivan Masonic Temple. Instead, Right Worshipful Brother Kent Howell, Area Deputy Grand Master, will be conducting the Lodge of Confusion, which is a whole lot of fun. The more lodges represented, the more fun everyone will have. The sign pictured at the top right of this page was presented to our lodge by the Tuscola Chapter of DeMolay in 1952. It reached the end of its useful life as a beacon last year, and was replaced by a newer, larger sign with both the square and compasses and Eastern Star. 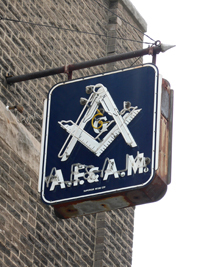 Worshipful Brother Myron Pangburn cleaned the facings of the old sign, and they now hang in the dining room and lodge room of the Tuscola Masonic Temple. Unless otherwise noted, all contents copyright 2014 Tuscola Lodge No. 332.